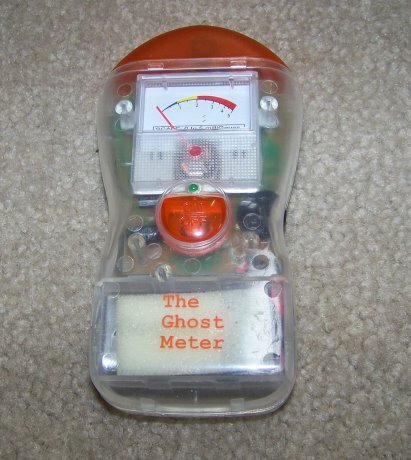 Before I go into the Waverly Hills, I wanted to talk about my very first piece of equipment I purchased for ghost hunting, The Ghost Meter. This cost about $20-$30 dollars on the internet, relatively cheap, this is an electro-magnetic field, (EMF), detector. I know it looks like a toy and in fact, it is even frowned upon by many in the paranormal circles. How it works is that you push the red button in the center to turn it on and then you hold it out away from you and point it towards what you wish it to scan. If there is an EMF being radiated out from anything, this will pick it up by flashing red at the top bar, the needle will measure how many milli Gauss (going up to 5) and if you'd like it to, it can sound off an alarm. There is a black dial on the side for you to turn the sound up or all the way down and usually on investigations, I tend to keep the sound off so it does not annoy anyone else I might be with. The large orange bar at the end will flash a very bright red as you come near electro-magnetic fields. 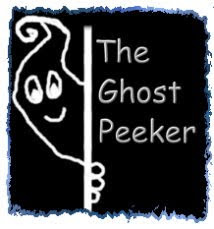 I have had very good luck using The Ghost Meter in connecting with an energy or spirit, especially the younger children spirits who seem to enjoy playing with it and interacting with me. Typical things it will pick up are EMFs from high power electrical wires, battery back up for computers, some alarm clocks, etc etc. Why is this important to know? Well if you are sensitive to high EMFs, you can become very ill, delusional, and even get a rash on your skin if you are exposed to these high fields for periods of time. The theory behind the EMF detector is that ghosts, spirits, or entities give off electro-magnetic fields. It is also said that spirits or entities will disrupt the current EMF, so that also makes it very important to take a base reading of the area you are investigating. Sometimes, they will try to use energy around them to help them to manifest themselves, or appear before you. This is a very basic piece of equipment and EMFs are something that I was very fascinated and interested in. Many times I've gotten hits where the K-II, I have not at all. Why? Well, that's a good q. It is the opinon of some people that these Ghost Meters are no good and that they are cell sensors and so will pick up cell phones. This particular one that I have and am showing, is not a cell sensor but only an EMF detector and it has not picked up any signals from cell phones. This Ghost Meter is not a complicated piece of equipment so keep in mind this is just a very basic EMF detector. I personally, have had really great luck with it. Remember that just because it did not go off, does not mean that there are not spirits or ghost around you.